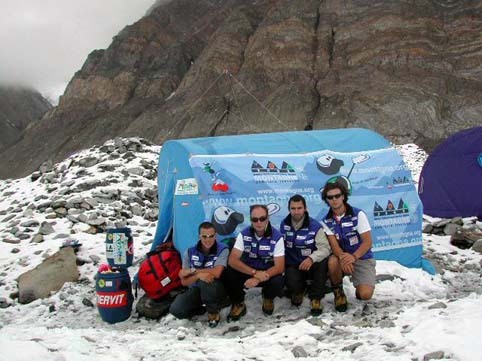 During August 2002 the Cordadoppia Association in Val Vomano -Teramo (Italy) has organized an expedition to climb the Peak Khan Tengri (7010 mt) on Tien Shan chain -Kazakhstan. After the first week necessary for acclimatation the climbers start to summit. At 6100 mt a serious accident to a spanish climber engaged us on rescue operation. After reaching the Peak Chapaeva summit, that is 6371 mt high, the weather changed, as usually happen on mountain. Fortunatly, we arrived to Camp 3, where we had to stop for three days, in the ice cave. While we were in the cave, outside it snowed and was foggy for all the time. So on the fourth day, we decided, unwillingly, to go down, enjoing us only for the first peak. It had snowed so hard and so more, that it was difficul moving our legs in the snow, also because weather conditions around us was of "whiteout". Traces were erased, and fixe ropes were covered by the snow. It took us about nine hours to arrive to camp 2, after climbing again peak Chapaeva, when it was still snowing. The day after the sun was shining, so we could go back to base camp. Also if our team didn't arrive on the top of Khan Tengri, we are very satisfied of hard and positive experience lived on Tien Shan. The Khan Tengri 2002 Expedition has had the patronage of "Commitee 2002 International Year of Mountains" and more agency. the president of "Cordadoppia Association"